SB and then NB on I-93/US 1, or if you're from the area, NB and then SB on Route 128. It's unlikely that MA 128 is along for the ride here anymore. 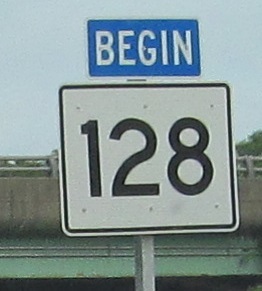 At best (best for the route number), 128 now ends where I-93 meets I-95 in Canton, and at worst, it could end all the way up at the northern 128/95 junction in Peabody. Had the Southwest Expressway been constructed, MA 128 would never have been an Interstate, I-93 would have begun at the north end of Boston's Central Artery, and the entire beltway would have been numbered as MA 128 exits starting at MA 3. (The rest of the Southeast Expressway would have just been MA 3 as well.) 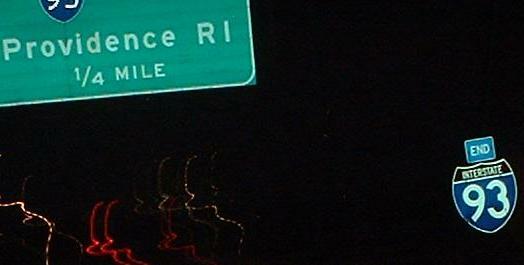 Incidentally, not sure why the Exit 4 signage is squished on the right, and yes, that END sign is 1/4 mile premature. Back to US 1 main page See? 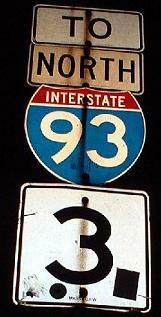 As I-93 SB ends, MA 128 begins. At least now. 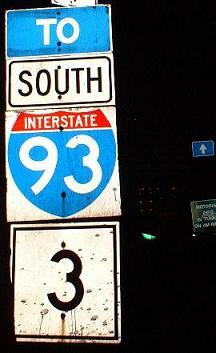 This also becomes I-95 NB, which is probably where the blue sign comes from. Actually, these are at onramps and shouldn't be labelled "TO". Note the contrast of groovy old shields to bespattered, RIDOT-style new shields. 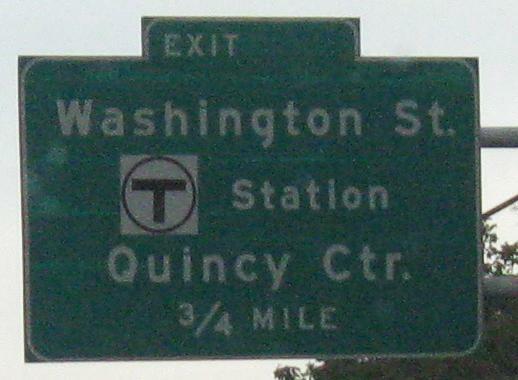 The NB onramp's BGS is the only overhead sign I know of with all three shields properly on it (1, 3, and 93 multiplex from "Storrow Drive" down to the MA 3 freeway split). There is one correct assembly I've seen as well (see I-93 folder). More ugly new shields, as well as the first surface indication of I-90 EB! It wasn't even open at this point!